The scene in Sacramento on Thursday. Real-time maps from Berkeley Earth, a group that analyzes climate data, show that air quality has rapidly deteriorated across northern California and reveal just how bad it is compared to the rest of the world. Specifically, air quality in Sacramento, the Bay Area, the Central Valley, and elsewhere in Northern California fall into the very unhealthy category. The Air Quality Index—a standardized way of taking stock of how much pollution regulated under the Clean Air Act is in the air—was in the low to mid-200s as of Friday morning for much of Northern California. That’s the equivalent of smoking half a pack of cigarettes a day. Chico, which is just down the road from the still burning Camp Fire, had an Air Quality Index above 300. Healthy air quality is anywhere from 0-50. That puts California in a class of its own. China and India are usually the world’s air pollution hot spots owing to massive cities where industrialization and lightly-regulated vehicles can create toxic, soupy air. But the Camp Fire has ensured that even if just for a few days, residents in one of the most developed parts of the world in a state bent on cleaning up pollution are forced to breathe the worst air. Global air quality data for Friday shows that California has the worst air on Earth. 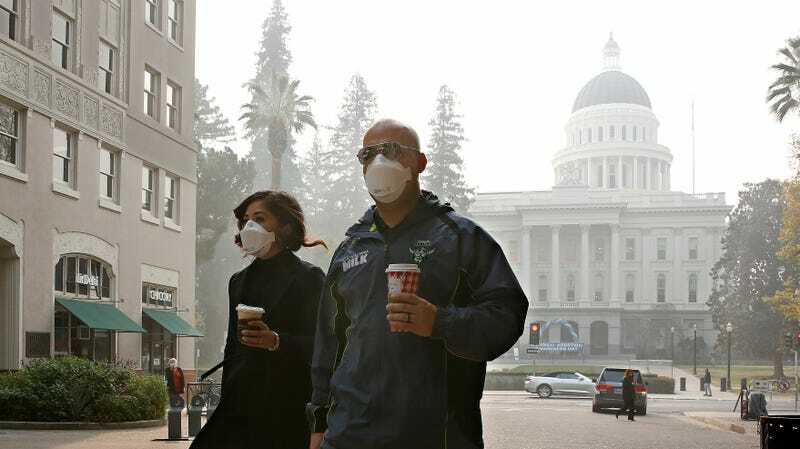 The toxic air has prompted schools to close and cities in the Bay Area to hand out masks. A friend in the Bay Area—more than 140 miles from the fire—texted me a picture of the smoke-filled sunrise, telling me it “smells like we’re camping outside.” He’s keeping his toddler-aged daughter indoors all day and fears for her lungs. All of this reveals some of the hidden costs of climate change. Large wildfires are becoming more common and wildfire season is stretching longer as the world warms. More polluted air has accompanied these trends. Research published earlier this year shows that in the western U.S., air quality has actually deteriorated on the most polluted days since 1988 due to wildfires. All of that creates a huge drag on the economy. Beyond lost learning days for students, poor air quality increases the risk of hospital visits for people with pulmonary diseases like asthma, as well as young children and the elderly. Air pollution can also lead to heart attacks, strokes, and a dizzying (and growing) array of adverse health impacts. All told, the health impacts of smoke from wildfires between 2008-12 resulted in an estimated $11-20 billion hit on the U.S. economy. Smoke can also cause people to stay home to avoid polluted air, missing work, and with it wages. These impacts pile up on people of color and low income communities, further entrenching poverty. And this pollution also claims lives. Research presented last year at the American Geophysical Union estimates that smoke from wildfires causes an excess 25,000 deaths annually. That number will rise to 75,000 by 2100 due to climate change, even as the U.S. population as a whole declines. The loss of an entire town is clearly the most pressing concern in the wake of the Camp Fire. But the air quality issues that have come with it reveal yet another way we are completely unprepared for our hotter, smokier future.